People raise their eyebrows at me all the time. They think I have some magic trick or they assume I’m a crazy blogging genius who works 60+ hours a week. Neither is true. Blogging is for real. 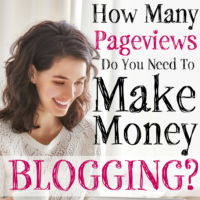 Making money blogging is a thing! I can’t tell you, YOU should start a blog. It’s not for everyone. You need a passion. You need to build and get to know your audience and then share your passion to provide your readers with solutions and value. When I started out as a blogger, I literally had NO clue. I didn’t know where it would take me. I knew I was good at budgeting. I knew I was making some money running an in-home daycare. I figured I could share the information with other women who wanted to do the same. I figured it would be fun and helpful. If I made a little extra income—cool! It’s perfectly natural for people to question the idea of blogging and making money from a blog. I mean, blogging wasn’t even around 15 years ago. People had barely even heard of blogging ten years ago. Now it’s a huge market. Any time a business opportunity is new and offers “success” right away, it sounds sketchy, right? Well, I wanted to share with you the reasons why blogging isn’t a scam at all, but a great, easy way to earn money while you take control of your life. If you’re on the fence about blogging, let me calm some of your fears. I worked in law enforcement. I ran a daycare from my home. I promise you, compared to these two jobs (and practically any other job you've had), blogging isn’t hard. In fact, it’s an easy, satisfying job where you use your knowledge to help others. Plus, you set your own hours, control your message and work as much as you like. Blogging is opportunity! I’m not a tech-savvy person. I was never great with computers, typing and software, but starting a blog is really easy. If I can do it, you can do it. Check out our step-by-step guide for starting your blog here. Blogging isn’t only easy, it’s also one of the cheapest hobby-to-income projects to take on. There are free platforms out there to start hobby blogging and even if you decide you might eventually want to take it further, the platforms that grow with you (like WordPress) don’t cost a lot to set up. Your whole blog can get up and running for around $50. Once you start blogging, it’s possible to grow from a hobby to a home business, or even bigger. 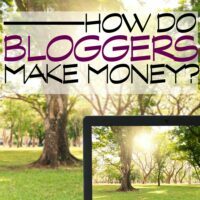 So, is it hard to make money blogging? Not if you follow the right steps. Of course, it doesn’t need to expand into a crazy full-time job/blogging empire. You can blog as a hobby OR blog to generate income. It’s within your control—totally up to you! Get help setting up your blog if you struggle with the technical side. Do the minimum to start and then as you earn more, hire out to cover the areas you find challenging. All you need to do is focus on writing what you know. Blogging is a great way to get your voice out. Use your knowledge to help others. Share tips. Let others know what works for you and what doesn’t. It’s an awesome outlet to express yourself and to connect with other people. You’ll make friends, meet people and learn more than you ever imagined! When you first join the blogging world, the big question everyone seems to have is, “How do I earn money on my blog?” It’s a good question too. The whole monetization aspect is a bit confusing at first and even intimidating. First, let go of the idea it’s wrong to be making money blogging. Even if your mission is to help people and you want to do everything out of the goodness of your heart, understand people value what they pay for. If you’re sharing positive messages, advice, tips and information, then you deserve pay for it. It will even make your message even stronger and more legitimate. Making money from blogging comes from a few streams. You get paid for being what’s called “an influencer.” This means you endorse products through sponsored posts and become an affiliate for products and companies that give you money to write about them. Never endorse or promote a product you wouldn’t enthusiastically promote to your best friend. If you follow this rule, you’ll be awesome at blogging. You will never feel like you’re selling out or “tricking readers” into buying from you. You’ll keep your integrity intact and feel great about what you’re doing. If you want to know and understand more about affiliates, check out making sense of affiliates and finding affiliates that work for you. Also check out our core affiliate strategy guide to help you get started. In addition to sponsored posts and affiliate income, many bloggers belong to ad networks where they receive money from advertisers who run ads on their sites. You can also earn money from selling and promoting products and services. These might be your own products or products from a fellow blogger or company you support. Once again, never endorse or support products you don’t believe in. Your blog isn’t only a method for selling to your readers. Your blog should first and foremost be about your message. If there are products and information to help readers better apply your message, then why not support and promote them on your site? All the better if it helps you earn money too. Check out our 10 Steps to a Profitable Blog Checklist for more on how you can make money blogging. I get asked this often and the short answer is: it’s not about pageviews. It’s not about social media followers. It’s not about how many likes you get on Instagram or how many people “pin” your posts. Some of the most successful bloggers I know get fewer page views than the bloggers who’ve worked for years, but earn nothing. I’ll say it again: It’s not about pageviews. Of course, you need to reach your audience. Being self-hosted through a host like Bluehost gives you control over your site and helps you to easily monetize and promote your blog. It also allows you to use a product like ConvertKit to capture and build your email list. See, the readers of your email are the people who really LOVE your blog. They’ve opted in. They want to hear your message. They’re your audience. I know you’re still worried about pageviews. Many ad networks hinge on pageviews, BUT, if you’re focused on keeping your message clear and consistent—producing great content and posts for your readers—then your pageviews will come. Start an email list and allow readers to opt-in by offering them a freebie or a downloadable piece of hot content. Your readers will build up. Don’t stress about pageviews! Is Blogging like a Pyramid Scheme? Blogging isn’t like a pyramid scheme because the internet is VAST. There are plenty of readers out there, so you aren’t competing with others to sell your leggings, nail polish, essential oils or whatever. There’s enough internet for everyone—and everyone wants it! The similarities to a MLM business are there. Like a MLM (multi-level-marketing) business, you’re writing to a core audience. You have customers. You’re promoting a product or several products. The biggest difference is YOU are your own boss. YOU are writing to your own audience. You are building up a core of followers. The other great benefit of making money blogging as opposed to becoming a sales rep for a company is there is a HUGE potential audience. You will reach people who you don’t even know at all. People who you’ve never ever met. 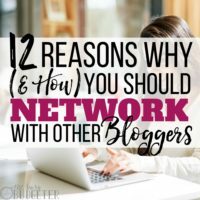 You aren’t limited and you aren’t competing with other bloggers. There’s plenty of room for everyone. My audience isn’t the same as your audience, even if our topics are similar. With blogging, you’re promoting your product to your people—the people who follow you, read what you write and love you! You’re sharing knowledge, tips and information. There’s no limit to when or how you share it. There’s no sales quotas or minimum caps. So, no, blogging isn’t a pyramid scheme. There is regulation in place by the Federal Trade Commission (the FTC) requiring bloggers to disclose any time they feature affiliates or promote a product. So, it’s not deceptive, it’s right there in front of your audience. But here’s the deal, if you’re writing good content about products you believe in and following the GOLDEN RULE of blogging, then you’re going to be fine. If you’re writing about a great product, why WOULDN’T you include a link to help your audience easily find it?? I know when I write about different products or ideas and don’t include a link, I almost instantly get emails from my readers asking me where they can find a resource, ingredient or helpful tool. I wouldn’t ever write about a product or service I hadn’t tried or wasn’t sure about. My relationship with my readers is built on trust. So when I mention a product, they want to know where they can get in on the deal. When it comes down to it, if you know your audience and always write with honesty, you should feel great about blogging. You're giving your readers good, quality information they want to find. They’re actually looking for it on the internet RIGHT NOW! You’re serving them by providing the information they need and want. When you look at it that way you see, blogging and affiliate marketing isn’t underhanded at all. You could sell ANYTHING, but you’re selling a product or service you’re passionate about and understand. You aren’t beholden to affiliates. You are beholden to your audience. Stay true to them and they’ll stay loyal to you. Those who promote products they’ve never tried or use their blog as a platform to sell, sell, sell—well, they don’t build up a great audience. No one wants to read their stuff. People unsubscribe or cease to click. Why? Because no one wants more garbage on the internet. If you know you aren’t actively trying to be part of the problem, rest assured you are part of the solution. Get to know your audience. Date your list. Ask yourself what are your reader’s problems and how can you help them solve those problems? Provide value to your reader. To provide value, always blog about topics you’re passionate about. For me, it’s budgeting, helping moms find ways to work from home and manage their households. For you, it might be gardening, cooking, books, art, design…find the topic that speaks to you and you're enthusiastic about, and then write your heart out. Blogging is awesome, you guys. It’s a great way to earn money and it’s the best career I’ve ever had. If you’re worried that making money blogging is a scam, I’m living proof it’s not. Blog with honesty about what you know, and the rest will follow. So, what are your favorite topics to write about? How do you connect with your audience? Do you still think that making money blogging is a scam? I totally agree with you. Blogging is not a scam. But it does take a ton of work. Usually people see blog income reports and assume it’s easy to make money blogging just became we can blog whenever and wherever we want. I just started my blog about six months ago and spend 25-30 hours blogging. I have made $0 from my blog. It takes time to build a successful blog. Great info on blogging here. That’s for sticking up for us! Haha. And to echo what Ms. FAF says above, it does take time! Thanks Rosemarie! We are now in our second month of blogging and have followed a lot of your advice. You, and other generous bloggers, have made our journey much more clear and organized! Ms FAF is spot on in her comment. Blogging is not a scam, many people are very successful at it. But too many people are sold the idea that blogging is as simple as throwing up a site and watching the cash come flowing in. It takes work. A lot of work! I’ve valued your posts about blogging. I’m thinking of moving my blog over from wix to WordPress & hosting on bluehost. Once that’s finished what do you believe are the next steps in starting to earn an income? Great post Rosemarie! I try to write in such a way “would I want to read this”? I do get turned off when it is obvious the writer just wants a sell. I choose NOT to be that kind of blogger. Totally agree. I’m still a relatively new blogger, and things like affiliate and influencer are still tough for me to feel totally comfortable with. But I think sticking to things you’re passionate about and only doing sponsored posts and such of things you are truly excited about is how you stick to who you are. Like any other business, if done wrong, it can totally feel like a scam or sleazy. So, stick to your passions and be authentic. That’s how I think you can blog and make a business. Fairly new blogger here as well! Thank you for your explanation and motivation to keep at it! I am really enjoying blogging and creating a website, and it is definitely hard work!! We just have to keep pushing on, and doing the next thing. Weekly goals and a daily schedule have been really helpful for me to make sure I am focusing on important things first. We can do this!! Rosemarie, I just listened to your podcast interview with Nick Loper this morning. I have been blogging part-time for two years, but haven’t really understood the work and commitment involved and what it means to date my email list! I’m taking some courses, but right now trying to tap the power of Pinterest. Thanks again for sharing your insights and experience. Blogging is not for the faint of heart or for anyone in a big hurry. It takes time to learn the ropes and begin making money but it is totally worth it. Thanks for sharing with us at Merry Monday. It is a big world out there and blogging is a great opportunity. Thank you for this post. Blogging is such a great way to earn extra income, but it is certainly hard work! Great post – I like your honesty! Many readers need to hear that it takes TIME….not the “I made $500 my first month blogging”. Great post! It’s not for everyone but I don’t see myself doing anything else. Thank you for sharing on Merry Monday! Hope to see ya next week! Hey there, I am delighted to glance at this blog post which includes plenty of helpful data, thank you for sharing it! I recently started a blog, and I love it. Great job! Do this isn’t a scam. But I think there are people who lose money trying to achieve success, or doing this. And then, they try to recover their money and can lose even more. They trust in doubtful websites, like “BTCMT4”, these kind of sites steal your money, making you believe that they can recover your stolen money. Philippe Ballesio is the owner of this site. We need to alert to people who don’t know about this scam. You have given an impressive personal touch to this post of yours. Your writing style is also pretty unique. These tips of yours will certainly help the new bloggers out there who have no ideas what it is or whether they should do it. Thanks a top for sharing this. Thank you for sharing such great advice. Im gong to be reading your other articles about affiliate marketing and more. 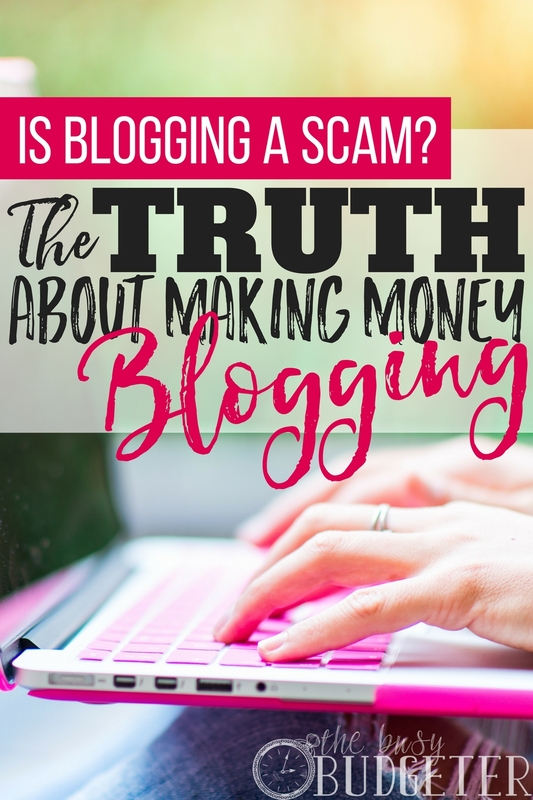 Blogging is not a scam! 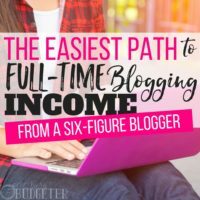 It took me far too long to start mine because I wasn’t sure if it was really possible to make money with a blog! Now I wish I started sooner! It really takes a lot of work, but the rewards are great!